After driving up the Gunflint Trail in Northern Minnesota this fall and stopping in to see the Gunflint Lodge, we wanted to stay here some time. Crowd Cut to the rescue! They offered 1/2 off for a two-night stay, so we combined that with a Groupon for Cove Point Lodge, and we had our three-day weekend on the North Shore. There was little snow along the shore of Lake Superior, and not much nasty weather (which always makes for better photos!) But when we drove up the Gunflint, we saw more snow and much colder temps, with windchills hovering around -35 degrees. Below zero. But we were dressed for it, so it wasn't bad. Saturday we hiked up to the Overlook. 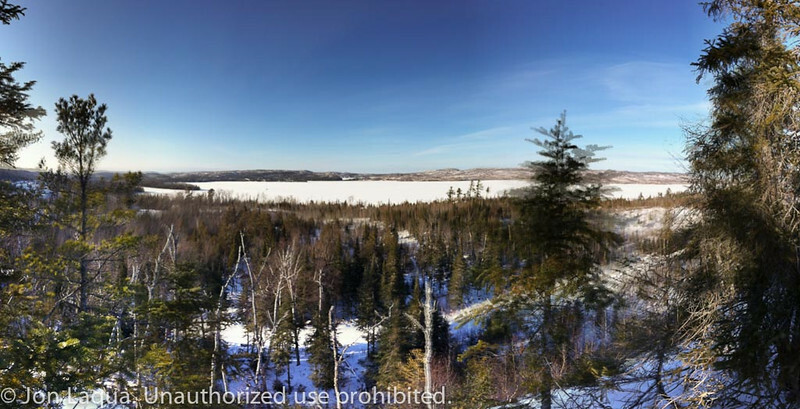 Gunflint Lake in the mid-ground, Canada across the lake.